Prominent & Leading Manufacturer from Bhavnagar, we offer monofilament rope. We have firm allegiance in developing finest grade Monofilament Rope. These monofilament ropes have become our specialty, because we conduct result oriented R&D activities and present the best in class ropes that help us to create a huge client base. 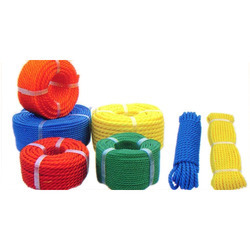 Demanded widely for its unmatched breaking strength, the offered ropes are made from premium grade HDPE fibers and extensively utilized for rugged industrial use and shipping and fishing applications. Further, the highly durable ropes can be ordered from us in varied sizes at a market leading price. Ropes and are Applicable to New Rope Only.